In the article, Lacy also touched on the velocity of money. While I agree with Hunt that velocity has generally been falling, the equation itself is useless. As I have pointed out, velocity can rise or far with rising or falling GDP. It is not an independent variable that can be tracked. Velocity = Value of transactions/supply of money. This expression can be summarized as: V = P(T/M) , where V stands for velocity, P stands for average prices, T stands for volume of transactions, and M stands for the supply of money. This expression can be further rearranged by multiplying both sides of the equation by M. This in turn will give the famous equation of exchange: M(V) = P(T). Many economists employ GDP instead of P(T), thereby concluding that: M(V) = GDP = P x (real GDP). Since V is P(T/M), it follows that the equation of exchange is reduced to M(PxT)/M = P(T), which is reduced to P(T) = P(T), and this is not a very interesting truism. It is like stating that $10=$10, and this tautology conveys no new knowledge of economic facts. The above paragraphs are excerpts from Fran Shostak's Is Velocity Like Magic? For further discussion, please see Velocity of Money Picks Up: Inflation Coming? Stagflation? How About Deflation? In regard to hyperinflation, I have been asked many time what it would take for me to change my mind on that happening in the US. My response, has been unchanged for years: Give Congress Control of Money Supply. MMT does precisely that. There is no project that could not be funded including AOCs absurd Green New Deal which might cost as mush as $200 trillion. It would not stop there. Guaranteed "living wages" and "guaranteed jobs would finish it off. The amount needed to have a living wage could never be met. Prices would soar along with the guarantee. Hunt says interest rates are 50 basis points too high. In relation to the Fed's mandate, I believe Hunt is correct. If one wants to factor in asset bubbles the Fed isn't. Alternatively, the Fed should have started hiking in 2010 or 2011 and be cutting rates now. 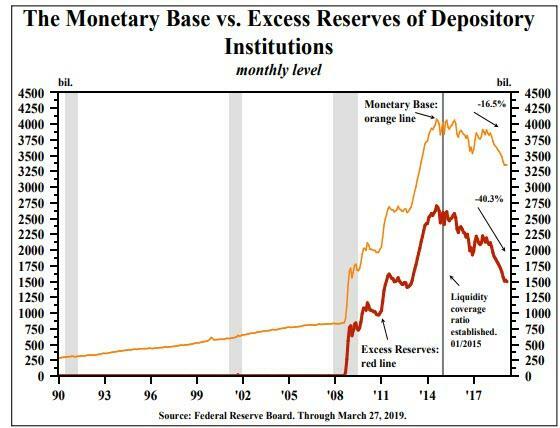 The Fed is constantly chasing its own tail. I believe that is what Hunt means when he speaks of lags. If so, we are in agreement on that point as well. Regardless, because of Fed actions and the lags, I am certain we are headed for another very deflationary asset bubble bust. The next deflationary bust could easy last for years, perhaps even without the job losses like we saw in 2008-2009. I discussed the job setup in Zombified Economy: What Will the Next Recession Look Like?